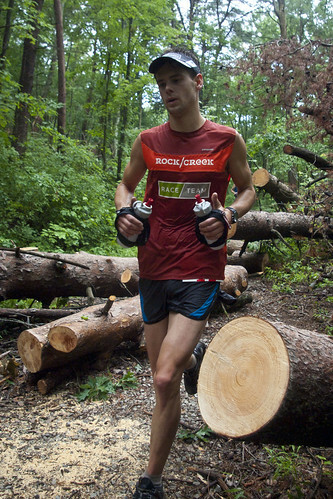 I had been looking forward to running Rock/Creek’s Chattanooga Mountains Stage Race for a while. I knew it was going to be particularly challenging this year, since I raced the Eagleman 70.3 four days prior to the first stage. It was also nice to change the order of the stages, putting Raccoon Mountain first to have fewer bikes on the trail. Stage one went great. I felt good, maintaining a nice pace without over exerting myself. I wore the Salomon SpeedCross 2 because it is light and the terrain wasn’t technical. For Stage two, I decided to wear the Salomon XA Pro 3D Ultra. They provide a lot more support in the heel, since my ankles felt weak from the previous day. Stage two didn’t go as well. I took it easy for the first five miles, and then decided to pick it up. At about mile eighteenm I become severely dehydrated and had to run/walk it in to the finish. I didn’t realize how dehydrated I had become until it was too late. I should have carried two bottles! I didn’t want to make that mistake again, so for stage three I went out easy, trying to drink as much as possible. By the time I got to the Signal point aid station, Matt Sims and Chad Wamack had caught me. We hung together until the finish pushing, the pace the whole way, trying to stay ahead of a few rivals that where on our tail. I wore the XA Pro 3D Ultra again, since they work so well with the rugged Signal Mountain trails. I came out twelfth overall for the three days. It was a great experience! Thanks to the Whortons, Rock/Creek, and all the volunteers for making it happen.